It is the challenge of the Religious School to touch the heart and soul of every student through the study of Judaism. The school creates an environment where students learn to be comfortable being Jewish. Younger students experience Judaism through their senses; music, art, cooking and stories expose them to the richness of Jewish culture. Intermediate students search for answers to life’s questions through an exploration of Jewish values and feelings. Older students develop awareness for our rich history and modern Jewish community. They are encouraged to apply Jewish concepts to social action and personal decision making. 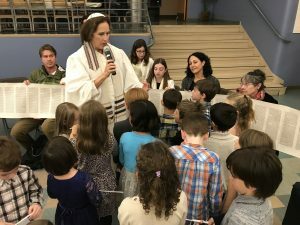 A successful Religious School program incorporates Jewish learning into a child’s developmental stages leading to a foundation of ethical Jewish values and a deep pride in our People’s way of life. Interested in trying out Religious School for a day? Click here to let us know! Below are links to view and download PDF versions of our grade specific calendars for the year. They have everything from Religious School dates to family programs to fun opportunities for that age group. If you have questions about these calendars please reach out to McKenna or call us at 503-222-1069. Beth Israel Religious School is for students in Pre-Kindergarten through grade 5. The school calendar closely matches with the Portland Public School calendar, beginning in September and ending in May. 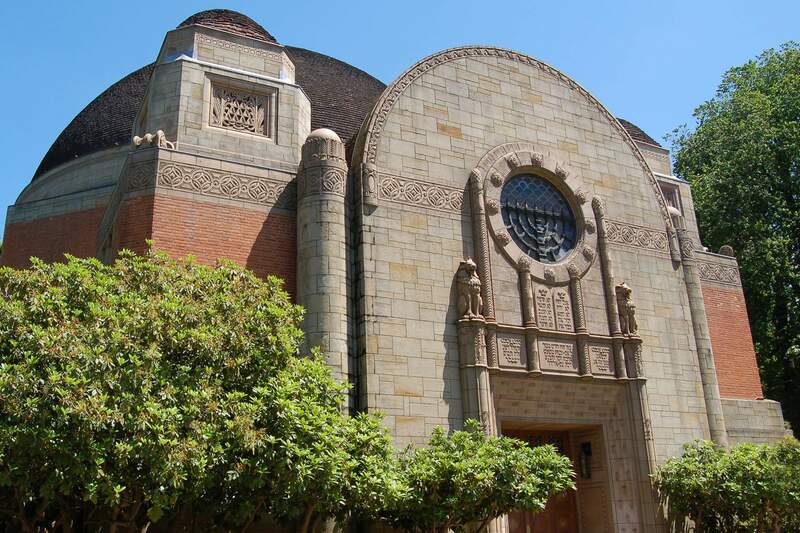 Our Sunday morning begins in the Main Sanctuary at 9:15 a.m. with Mishpacha Minyan, a spirited Family Service full of singing, dancing and energy. Clergy joins Ben Sandler and other musicians to lead this popular service. Parents and younger siblings stay and participate before walking kids over to class. Our Religious School is an arts integrated program. Each week, students attend specialty sessions for music, dance, drama and visual arts. Grades 3, 4, & 5 IHP classes meet on Thursday afternoons from 4:30 to 6:00 p.m. in addition to regular Religious School on Sunday mornings. Students in this program receive all the regular Hebrew School curriculum as well as learning reading fluency, vocabulary, t’filot (prayers) and root word forms. IHP students grow to understand the beauty of the Hebrew language through our “Hineni: Hebrew Through Prayer” curriculum. 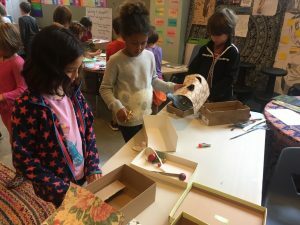 Our Jewish world is brought to the classroom through a hands-on approach to synagogue life. Extends the study of who the people are in the Temple, how and what we celebrate. Explore the meaning of the holidays and the ritual items used in our Jewish world. Children are blessed by the clergy during a Consecration Ceremony/Simchat Torah which includes a live Klezmer band and dancing. Family Program: Wimpel Making. Parents and students create a beautiful wimpel that is displayed on the bimah and then kept as a treasured ritual item to be used for future life cycle events. Did you know? The Union for Reform Judaism CHAI Curriculum is designed to facilitate lifelong Jewish learning. It focuses classroom learning on 3 strands: Torah, Avodah (love) and G’milut Chasadim (acts of loving kindness). All of our CBI 2nd through 5th graders learn from this curriculum which brings the home and school together. Students begin developing personal connections and learn about the power of the 3 strands. Students refine their own understanding and definition of k’dushah (holiness). Begin to understand how ritual objects, symbols, prayer, and behaviors can make moments and places special. In grade 3, families may enroll their children in the 2-day Integrated Hebrew Program. Family Program: Becoming a Bar/Bat Mitzvah! Picking A Date. Students start to see a direct relationship between being a member of a community and our behaviors. Throughout this year, the theme of Reform Judaism and the power of community will connect the 3 strands. Beginning with a light breakfast, 6th and 7th graders meet for two sessions with a Tefillah, learning service, in between. The first session core class works on a range of topics such as Israel, social justice, Jewish history, ethics and identity. The second session are the B’Nei Mitzvah Studies with Cantor Cahana, peer tutors, and experienced Hebrew teachers. Each week ends with a catered lunch and social time. In grades 6&7, learning becomes more sophisticated. 8th grade and High School students are ready for the next step on their Jewish Journey, and to begin establishing their leadership within our community. 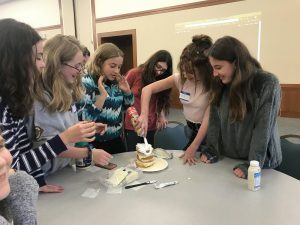 They start their day with lunch and socializing with friends and then break off by grade to explore subjects such as Jewish identity, comparative religions, Jewish history and social justice. In grades 8-12, there is advanced study of what it means to be on a Jewish Journey and the emergence of becoming a Jewish leader in the community. Topics include dealing with social and religious ethics, open discussions with clergy and teachers on political issues and other items of concern to Jewish teenagers today. Beginning in 9th grade, students may choose to work as Madrichim (classroom aides) in lower grades to gain valuable background and experience that can be applied to future roles in education. 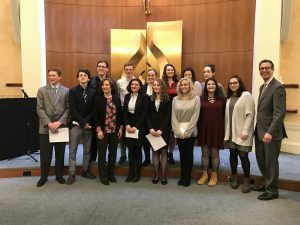 Religious Action Center’s L’Taken Seminar to Washington D.C. is offered to students 10th grade as well culminating the end of the year with the Confirmation ceremony during the festival of Shavout. 11th and 12th grade students are eligible to participate in a trip to the South where they get a taste of southern Jewish life, learn about the Civil Rights Movement and solidify their lasting relationships as well as becoming eligible for scholarships to travel to Israel on teen NFTY trips. A beautiful Graduation service created and led by seniors takes place at the end of the grade 12 year.